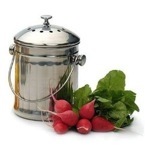 Kitchen Composter Ideas. Home composters for kitchen scraps. 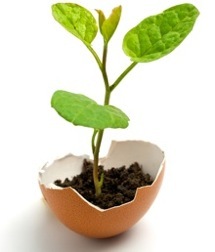 A kitchen or backyard composter can turn tons of kitchen waste into a yummy (for plants) food and growth medium. Home composters recycle vegetable and fruit peelings into food for your gardens, plants and trees. Use a kitchen composter to dispose of everyday organic kitchen waste. Into the composter goes all vegetable, fruit and plant waste, whether you're peeling coring and preparing or cleaning out the fridge. Depending on the type of kitchen composter you choose, either the natural decomposition process will turn the scraps into compost or worms will convert the scraps into worm castings - a highly prized natural plant fertilizer. When you're composting kitchen waste, scraps can be kept in a container in your kitchen temporarily and transfered to a backyard composter every day or two. Some containers are attractive enough to be kept on the counter. Others can be put in a handy spot elsewhere. This is especially useful if your composter is a worm composter because worms like their food to be slightly decomposed. Below we have our selection of backyard a composter suitable for composting kitchen waste. We've included a container in which to keep your kitchen scraps that are waiting to go out to the bin. Also, you can make your own backyard composter or worm composter. It's easier than you think. Here are some of our favourite composting products. Having a composter means you'll also have a container of scraps in the kitchen between emptyings. Really, you can use almost any container, a favorite of ours being the plastic ice cream pail. It works but it's not very pretty and begins to smell if not emptied daily. This cute little Stainless Steel 0.5 Gallon Mini Compost Pail (See all Compost Bins) holds a half gallon of scraps until it's time to take them out to the compost bin. Attractive enough to keep it on the kitchen counter, and changeable filters keep it smell free. The size pictured at the left holds 8 cups of scraps, just perfect for a small kitchen. For larger families and kitchens with no space issues, the 1 gallon RSVP Compost Pail (See all Compost Bins) holds double the amount - a roomy 16 cups - and looks just as comfortable in the kitchen. "This is a sweet little can, shiny and bright, and looks good on the counter top"
"I love this little silver bucket. It looks good on my counter next to the sink. It's easy to clean and with just a paper towel I can make it shine." The Envirocycle Composter has been on the market for 20 years. 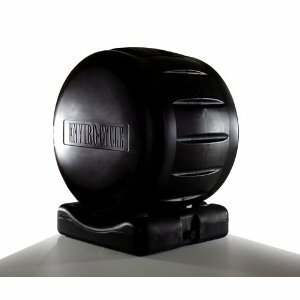 Durable, spacious and effective, this composter measures 25.5 x 29.5 x 20.5 inches and arrives completely assembled. It's easy to turn and the low profile makes it easy to access the contents and to add material. Among it's attributes is that the base is uniquely molded to collect the valuable compost tea which keeps the contents from becoming saturated and it's made from a high percentage of recycled materials. "Now, being in it's 4th year of life, I can tell you it works JUST LIKE NEW. I love it." "I would definitely recommend this composter to anyone wanting to compost in their yards. It keeps the contents enclosed, aerated, and easily accessible. "